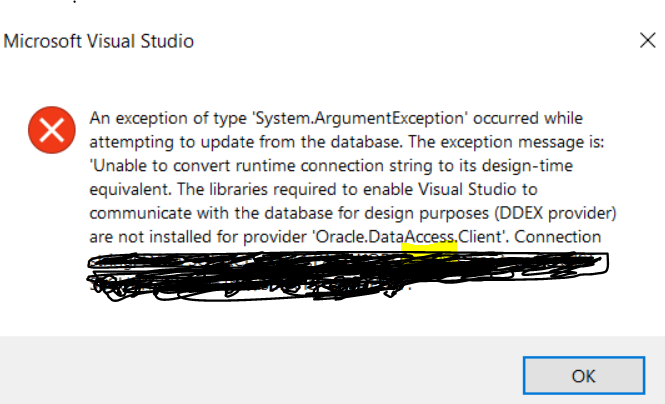 I am trying to update my edmx file using VS 2017 but each time I click on Update model from database option it is showing me the below error . In my system ODTwithODAC1120320_32bit is installed. I could update the edmx from VS 2010 successfully. Now I have installed ODAC for VS 2017 from link but still the issue is coming. I have downloaded the ODTwithODAC122011 from oracle site and tried to install but nothing is happening , it is just open a command window and after few seconds it got closed, seems like the installer is crashing. Can someone help me to resolve this issue ? Do I need to install anything else? problems updating Access database from Textbox help?